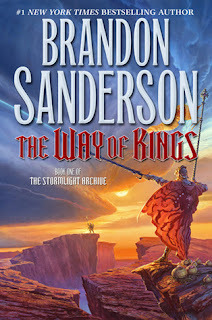 Brandon Sanderson, widely acclaimed for his work completing Robert Jordan’s Wheel of Time saga, begins a grand cycle of his own, with The Way of Kings, Book One of the Stormlight Archive. I am a day late. I came on to write my post yesterday, but I just had other things in my mind. So, in the spirit of the book I posted an Interlude. Sanderson says that Interludes are a way to show parts of the larger world; as the first question Carl came up with mentions. My blog centres around reading, but sometimes it is nice to get a better idea of what the rest of my world is like. On to the questions. I must say I am really enjoying this book! I am usually read bad at reading on a schedule because I get impatient and read the whole book, but this time I am trying to stick to the plan. This is helped by the fact that I have been busy and haven't been reading as much. This group read is being hosted by Deanna from Polishing Mud Balls. To join in or read other posts, visit the dedicated read-along blog. 1. In a recent interview Brandon Sanderson mentioned that the interludes are meant to show us parts of the larger world since much of the action is focused in one or two places. What do you think of the first two sets of interludes? Any characters or situations stand out to you? I actually enjoy the interludes. They break the book up nicely. I think in a book this long you would get tired of the same story-lines. It is not to take a break and read about some other people for a few minutes before resuming the regular story. In the Interlude 'Axies the Collector' I enjoyed learning more about the spren. There is a spren included in Kaladin's story, but it is said over and over again that she is not like other spren. There are spren mentioned in other situations, too, but it is nice to get some back-story on them. I actually wish this interlude had gone into more detail. I also enjoyed learning more about what is going on in the outside world while the main story is playing out and learning more about the different groups of people that are mentioned, but never entirely elaborated on. 2. In small increments Brandon Sanderson is revealing the geology and ecology of Roshar. What are your thoughts on what has been revealed thus far? I enjoy that Sanderson is bringing these things up without bogging the story down too much. It is obvious that a lot of planning went into the writing of these books. Sanderson has created an entire world in a very believable manner. One of the things I enjoy learning about, like I said above, is the spren. They tie into the nature of the world and are often present for his descriptions because they are part of the living and even the dead. Sanderson talks about the rocks, the plants, and the planet comes to life in your mind. 3. This second section of The Way of Kings featured two distinct story lines, those of Dalinar and of Kaladin. How do you feel this section of the book compares with the first section and what are your thoughts on either or both of these story lines? The first section had a few more story-lines, but now those other story-lines have become intertwined with these two. For Kaladin's story-lines I enjoy that the story continues to progress, but Sanderson also flashes back to talk about the events that lead to Kaladin's captivity. It is done very smoothly and never takes too much time in either time period. As for Dalinar, I really enjoyed learning about his visions. The reader knows that he is using a type of magic long forgotten on the world, but everyone else thinks he is going crazy. It makes for an interesting contrast and makes you wonder what will happen as events progress. Dalinar is thinking about a lot of things that have been taken for granted and raises some interesting points. I look forward to seeing what happens in the next section. 4. In the interview set out earlier in the week Sanderson talked about the Stormlight Archive being a series about the return of magic. What are your thoughts on this, particularly in relation to the visions Dalinar is having during the highstorms? I think this is actually a really interesting idea. In many fantasy novels magic is just taken as a given, but in this book people think you are crazy if you do something against the norm. The characters in the book have some amazing abilities, but they don't consider that magic. As a reader, I obviously think that Dalinar is having visions, but the characters in the book think that he is going crazy. The characters in the book cannot seem to grasp the idea that since there is all ready many magical things in use on a regular basis, it stands to reason that more is plausible. 5. There has been a change in this second section of the nature of the quotes prior to the beginning of each chapter. What are your thoughts on the opening lines featured in both sections of the book to this point? The quotes are interesting. In the first section it was the last words of people on their death bed. In the second section it is quotes. I enjoyed the first section more because after stating their last words there is always a description of said them and when to give some context. The second section treats things as more of a mystery. They fit into the story, but you are not told who is saying them and why. I look forward to seeing what the opening quotes are for the third part of the book. 6. In the questions for these first two sections we've talked about characters and the story lines and the world that Sanderson has created, but there are a lot of interesting flourishes and touches to The Way of Kings thus far (shardplate, spren, the actual Way of Kings book, highstorms, etc.). Talk about some of the non-character/non-setting things that you are finding either fascinating or annoying (or both) in the book thus far. Well, I have all ready mentioned my interest in the spren, so I will leave that subject for now. One of the things that really stands out for me is that men cannot read. The women do all the reading for them. On the one hand this is rather sad, but on the other hand it puts the women right in the front lines. It will be interesting to see how this idea develops throughout this book and the later series as a whole. The shardplates are very interesting, too. When Dalinar had one of his visions he went back to a very different world with very different shardplates. It was interesting to read about how much things had changed. It lead to Dalinar giving serious thought to how the use shardplates now. I liked Axies interlude as well. That giant spren in the ocean made me think of creatures from a Hayao Miyazaki anime, like Ponyo. I agree with you in that I like having something like the interludes to break up a long story. It does something psychologically for me in making me feel like I am progressing in the story and not getting bogged down at all. As much as I am enjoying the various story lines I find myself looking forward to the interludes as I have no idea whatsoever what to expect. Sanderson must be a master planner! I would love to see his notebooks and outlines. The level of detail and the way things tie together or look like they might tie together is incredible. I like your perspective on Dalinar's visions. I have been looking at them as something happening *to* him when it may actually be something he is tapping into either because of his learning the stuff in the Way of Kings books or his openness to looking at things differently or a combination. I am intrigued as to how this will play out. I like how Sanderson is treating Dalinar and those around him. It is a very natural human thing for us to do--to accept the seemingly impossible/improbable for long enough for it to become mundane and then refuse to believe the next "impossible" thing that comes along. It is silly to think with all the magic that they have in their lives that they are so dismissive of Dalinar's visions, and yet that is so like mankind in general. I definitely think the whole reading thing creates an interdependence that is interesting in a society with defined gender roles. Can't wait to find out more about why this is. @Carl: Fortunately for you, Sanderson has a habit of annotating his works on his website. While tWoK's isn't annotated yet, many of his older books are, chapter by chapter, where he describes certain reasons behind choices. Hopefully he does this for this series, too. On one hand I think that is a really cool idea and I am a geek for that sort of thing. On the other hand if Sanderson starts slowing down in his writing I could see myself getting frustrated at him for doing this. LOL! I loved the chapter about Axies not only for more info on the spren, but also because I thought it was pretty funny. No one has mentioned this yet, so now I feel weird :-/. One thought I've had about Dalinar's visions is kind of related to reincarnation. He's seeing visions of a past life. Like maybe he's one of the heralds living one life after another through the centuries and just beginning to be aware of his true self. Oh the possibilities! As far as the reading goes, I tend to think when something is denied a gender or group of people, it is based on power or fear. I'm waiting to see what event happened in the past that caused the right to read to be taken away from the men, and why the women have to cover one hand, among other things. It was funny, you shouldn't feel weird about it. There is waaay too much to talk about in these sections, which I love. If you are weird you are in good company, after all I talked about the wet feet of the people who live in the Purelake, for example, and no one bit on that conversational topic. LOL! I loved the humor of that part, especially the way Axies was thinking about/describing the person who was chasing him out of the alley. And of course naked visual humor is always funny. Isn't it? I do think Dalinar's visions are of actual events from the past. Thanks for the reassurance, Carl. I guess I just have a long history of laughing at things no one else finds funny, so I'm never sure. You talked about the wet feet of the Purelake people, but what I was most wondering about was how the Thaylen people (if I'm thinking about the right ones) have long eyebrows, that they sometimes tuck behind their ears. I would go INSANE! **Carl: I know. You can write 300 page books where author seems to forget about storylines, so I am impressed by how everything seems to be staying to course in this book so far. I will be curious to see how Dalinar's visions play out, too. **logankstewart: I am even more curious about Dalinar's visions after everyone seems to see them differently. I want to see how they are explained. That is very interesting on the annotation! Oh, yes, there are several humourous moments in these books. I thought of them at the time, but didn't think to mention them in my review. The reincarnation idea for the visions is a really interesting one, too. I am enjoying that one plot device has lead to so much to talk about! I am really curious to see the reading explained, too. Catching a glimpse of drunkspren is a noble pursuit! What I am finding so interesting about this book as to how much of it is sort of like a mystery. There is so much that we do not know. For instance, what is going on with Dalinar? Why was his mind wiped clean of memories for his wife? What were the events of life that shaped Kaladin to who is today? What is going on with Syl? **ibeeg: Yes, I am enjoying how this is sort of a mystery, too. There are a lot of unanswered questions!